Photographer: Miles Aldridge. Model(s): Kinga Rajzak. Stylist: Vogue Italia. 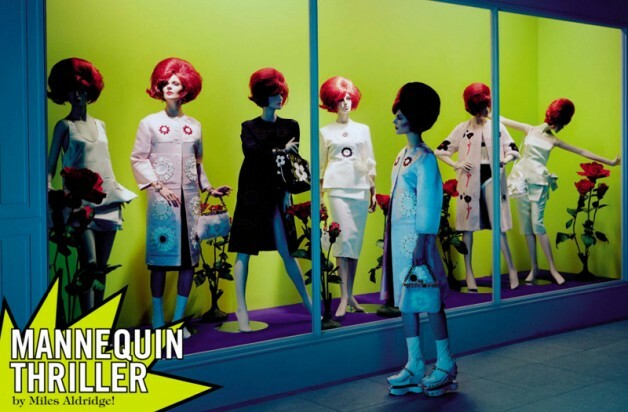 Kinga Rajzak stars in the fashion slasher ‘Mannequin Thriller’ by Miles Aldridge for the March 2013 issue of Vogue Italia. In the grand tradition of horror films, Aldridge has our leading lady mixing in with an army of mannequins masking unclear motives. Daring to disturb, this innovative artist never shies away from a strong statement, with provocative stories that call out our societies’ collective craziness. With just the right amount of repressed rage, this wonderfully, wicked editorial circles around the theme of plastic perfection. Playing the perfect 50’s housewife, Rajzak embodies the Stepford stereotype in all her gory glory. Laying among the shattered remnants of dissembled doll parts she blends in with these blanked faced beauty replicants, not a hair out of place, wearing a series of to-die-for looks inspired by the haute-horror styles of the Hitchcock heroines. Take a trip to neon nirvana in this kitchy mix of fashion and fear that is sure to leave you wanting more.